After having configured the video chat solution and before using it for the first time, please have a look at this article. You'll learn how to interact with visitors via video chat. Before we begin, make sure your computer is equipped with a webcam and a microphone. 1.1/ What should agents do? When you receive a new video call on your discussion panel, you have the possibility to accept or reject this video call (2). If it's your first time using this communication channel, you'll also have to allow your web browser to have access to your webcam and microphone (1). Be careful: Agents often miss this step because the alert on your web browser is not very noticeable. The alert appears at the top of your browser (screenshot taken from the Chrome web browser). 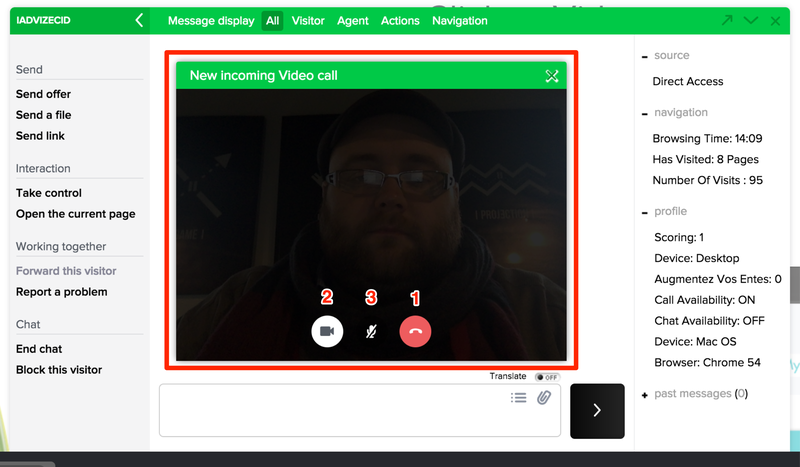 Once these actions done, the video chat window opens up in your discussion panel. As long as you haven't accepted the video call, you only see your own picture. From the visitor's side, as long as you haven't accepted the video call, visitors only see their own picture. When you accept the video call, your picture becomes smaller and ends up at the bottom right of the video. This way, you can see the visitor you're chatting with. The same happens on the visitors side of things. 1.2/ What should visitors do? Visitors have to allow their web browser to have access to their webcam and microphone. No other action is required. The connection is complete, you can now see the visitor! 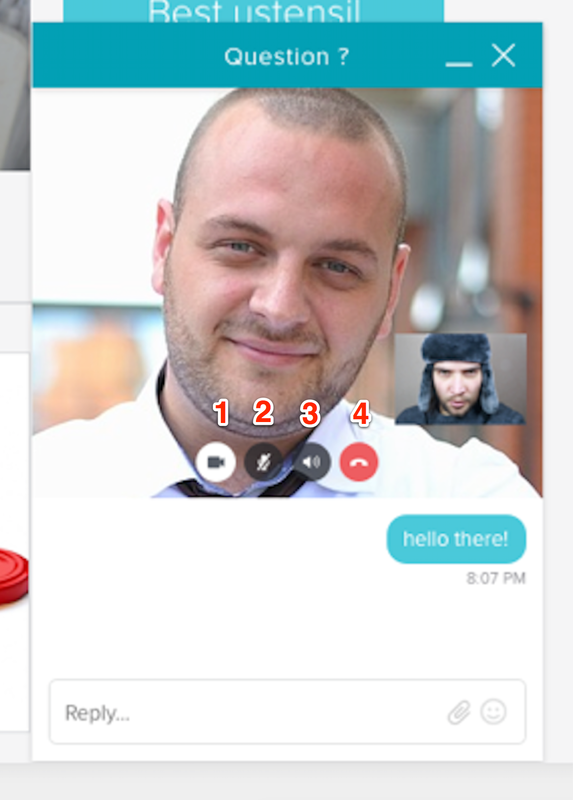 (1) Click on the red icon or click x to end a conversation. (2) Click on the camera to deactivate it or reactivate it. (3) Click on the microphone to deactivate it or reactivate it. You can also send written messages to your interlocutor. Visitors can deactivate their webcam (1), microphone (2), or the agent's microphone (3) and they can hang up (4). They have access to the discussion thread and see the alerts and messages you're sending them. They can also send you written messages. Launch the test available on this page: https://networktest.twilio.com/ This test should not show any errors, especially on the "UDP Connectivity" test. For security reasons, the Click to Video solution has to be loaded over HTTPS on the visitors side. The Click to Video solution doesn't work over the HTTP protocol. 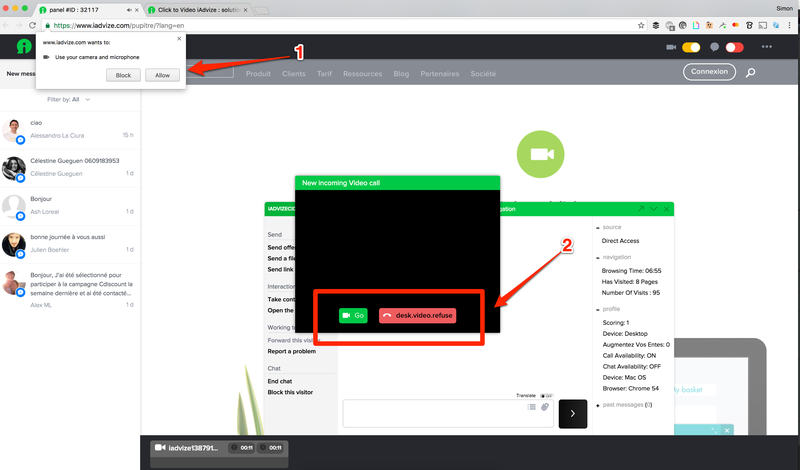 In order to use the video channel, your browser has to support WebRTC (the OS does not matter).